In case you missed our update on Tallahassee foreclosure sales, the year over year change in November showed a rise of 316%. 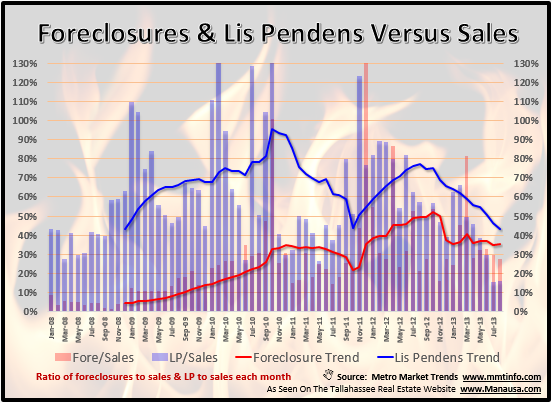 Yeah, that's not a typo, our latest report on foreclosure sales in Tallahassee showed 187 recorded in November, versus 45 that were recorded in November 2012. So is this bad news or good news for the Tallahassee real estate market? It's hard to fathom that a report of a substantial increase in the number of foreclosures could have any bit of good news attached to it, but we have found it. The key to seeing why this will impact Tallahassee in a positive manner lies in an examination of the entire distressed market as well as the process that occurs in the creation of a foreclosure sale. When a lender has a non-performing loan and they want to take formal action, they file a "lis pendens" to start the foreclosure process. If the owner of the property is not able to work things out or sell the property, the lender takes ownership or liquidates the property through a foreclosure sale. Thus, when we use the term "foreclosure" or "foreclosure sale," we are actually referring to last step in the foreclosure process. Historically, only a small percentage of lis pendens filings became foreclosures, as the owners were able to sell the property or make things right with the bank. But times have changed. Most homeowners do not have equity in their homes, so instead of an arms length sale, they must attempt a short sale in order to avoid foreclosure. If the lender(s) do not approve, then they will be foreclosed upon. The good news in the distressed properties market is that new lis pendens filings are on the decline. In the real estate graph above, new lis pendens are shown in green (one-year trend) while the one-year trend of foreclosure sales is shown in red. The blue line shows the ratio of foreclosure sales to lis pendens filings, and we have hit 100%. It will certainly go higher if lis pendens continue to decline at such a (nice) rapid pace. So the good news that we can glean from this report is that action is being taken to reduce the distressed properties in Tallahassee. Lis pendens filings are on the decline, and ultimately that will mean fewer foreclosure sales in the future. If you are interested in discovering how the latest news and the Tallahassee Foreclosure Report will impact your ability to sell a home, just drop me a note and we can schedule a time to review your home's value in the Tallahassee real estate market.